My daughter was married two weeks ago. It was a very fun wedding. The bride and groom did a great job planning the affair. The music was a swing dance band. Wendy and I did a 3 class community ed swing dance class. I think we did OK. I wasn't throwing her over my shoulder, but she did get twirled a time or two. At every place setting there was a 3 oz hex jar of honey. The label had the phrase above and the photo of the bride and groom. The picture of the jar above you can just see the edge of the photo. I bought Avery label #8162 that fit the jar nicely. At the Avery website I downloaded the Design Pro software. I was able to pick my font and add the cropped photo. Also a border and some color to the label. On the top of the jar is a round gold sticker of two hearts. We found them at Micheal's. The stickers fit perfect with a little fudge room to work with. The favors were a big hit we had many requests for more, but we only bought enough for the guests and a few extras. My nectar flow has been non existent the last week. My supers have not gained in any honey weight. I think a change is in the works. I have finally been seeing white sweet clover starting to bloom in greater quantities. White sweet clover is a major honey plant and provides the bulk of much of the honey collected in my area. My Basswood trees are just starting to open their flowers. The blossoms are heavier in numbers than they have been in the past. Hopefully the nectar will start coming in at a better rate in the very near future. It is fun to enter honey in the local county fair. They usually come early in the summer before the state fair. The entry can be a single jar. Read the entry criteria to make the proper entry. It is great to promote the honey industry by entering a fair. Your friends and neighbors will come and look at the entries to see who got a ribbon. It is nice to be recognized for turning out a quality product. The thing to look out for when entering your honey, is putting the honey entry into the proper class. I have had beekeepers be disqualified for mistakenly putting the honey in the wrong class. Most of the honey we produce is white honey. Light amber honey is quite dark like rust color and amber honey is very dark to black like coffee or molasses. Entering a fair makes you a better beekeeper by giving you habits of packing a quality filled bottle as an entry. This experience will help most of us produce a quality product in every bottle we fill. Plus you can make a couple bucks for getting a ribbon and bragging rights that you have award winning honey. What's up with my hive? If you don't see eggs or young larvae your bees probably have swarmed. Putting a frame of eggs in the colony should tell all. If queen cells are drawn out on the frame we could assume the hive is queenless. If no cells develop, the conclusion could be the queen is in there and not laying yet. During the nectar flow if there is still a 3rd deep to draw out, the bees will fill the deep with nectar. If you looked at the frames, there is very little brood and mostly nectar. In this case the drawn frames can be put on the outside of the top box. Any foundation on the outside can be brought in towards the center. This box will be the winter stores for the colony. It would not be a good idea to reverse this box. If drawing out foundation in the supers, they should be placed above the brood box. When they are filling up, add new super below them and move the now drawn supers up. It is important to stay ahead of the bees. Put two supers on at a time. Add more before the supers are full. It is better to pull off empty supers than if they are all full. If all of them are full, there was probably more honey that was available for the bees to collect. Register now for October class! Due to high enrollment (250) and large wait list (140) we are offering this class October 16 & 17, 2010. I planted a three food plots for Deer and Bees at my place. Buckwheat, White Dutch Sweet Clover, and Alsike Clover. Buckwheat (Fagopyrum esculentum Moench) is a broadleaf plant native to northern Asia. Seeds are brown in color, roughly the size of a soybean, but irregularly shaped, with four triangular surfaces. The seeds germinate and emerge rapidly when planted in warm soil, typically in three to four days. Plants grow rapidly, producing small heart-shaped leaves with slender, hollow stems. Although a field of buckwheat in full flower appears to cover the ground densely, each individual plant, if pulled up, will appear rather spindly upon close inspection. Flowering begins about three weeks after planting, and proceeds prolifically for a few weeks, before gradually tapering off as the plant matures. At the peak of flowering, a buckwheat field is a striking sea of white petals. After a flower is pollinated, a full-sized seed will form within 10 days, although that seed will need another week or two to reach maturity. Seeds appear and mature earlier on the lower stem, with seed development continuing up the stem as the plant matures. The prolific flowers on buckwheat have made the crop a good nectar source for honey beekeepers. The honey from buckwheat is black like molasses, it has a strong powerful odor and flavor. I usually find that people either love it or hate it. Usually no one is in between. Usually buckwheat honey commands a higher price due to limited availability. Catalpa trees are flowering right now. They have big heart shaped leaves and pretty white flowers. They produce long slender bean pods that hang down. Birds like the tree for the dense cover. I really have never noticed the bees working the flowers much. The significance of the flowering Catalpa tree is that it is the same time as the Basswood/ Linden tree nectar flow. It is easy to spot the trees from a distance to help give a clue when Basswood nectar is coming in. This cool weather has kept the bees cooped up in the hive for almost a week. Strong colonies have been chomping at the bit to forage. What do you do if you are stuck inside a hive for a week? What the heck let's swarm. Strong colonies should be checked for swarm cells as soon as this rain breaks. Checking all the brood boxes is important. Missing one cell is all that is needed for the bees to say ciao. I have been noticing flowers blooming everywhere. Later in the week it is supposed to reach the 80's. I have had beekeepers telling me today of some hives with two supers full and working on the third. I expect the nectar flow to get better with the warmer weather. Where is everyone at in the current bee realm. Right now the honey flow appears to be on. 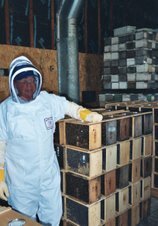 I have talked to several beekeepers who purchased bees through me on their progress. Most folks from the first load are in two and three deep hives with supers on. The early load benefited from ideal build up weather. Beekeepers from the second load had a little more weather issues. While it was warm early, cooler weather moved in and held back the build up by not letting the bees expand as rapidly as was hoped for. Right now the second load beekeepers should have on their second box and maybe their third on, if they desired a three deep hive. Supers are going on the two high colonies. Bee populations have been building up quickly now and there is anticipation of some honey for everyone. The rainfall has been sufficient, now some warm weather is needed for a strong run of nectar. If your colony is filling the brood nest up solid with honey the bees may have swarmed on you and/or there is no queen present. If the supers are on and the bees are not doing anything in them. Removal of the queen excluder may help this get started. Put the excluder back in later. The entrance reducer can now be removed. Comb honey can be put on the hive if honey is coming in. Putting on the comb honey to early may lead to holes chewed in the thin surplus foundation by the bees. I was at the MN Hobby Beekeeper meeting tonight. There was a very good speaker who talked about raising his own queens to fill up his 500 colonies that he manages. When I left I know that there are Basswood trees near the meeting place. I went to check them out to see where they were at as far as their flowering. The trees have just opened their flowers. Usually the trees in town are about a week ahead of mine. My Basswood trees have not flowered but the seed pods have yellowed from the green color they were at. I think they will bloom in a week. Normally my Basswoods bloom around July first, this nectar flow is two weeks ahead of schedule. There is only one thing holding back this nectar flow and that is some heat. Hopefully the weather can come up with a stretch of 80's will help. I am sold out of queens for 2010. Today I saw my first white sweet clover bloom in Stillwater on Hwy 36. This should mean a nectar flow is imminent or possibly going in your own beeyards. White sweet clover is a major honey crop for the upper midwest. Here is a link about white sweet clover.